Traditionally, the top seed in Pool A has been pretty safe. The placement of the final three teams has been anyone’s guess. Last year, Public Enemy won two games in pool play as the bottom seed in the group. With four teams from four regions, only two of these teams have played so far this season, so there is very little certainty about how these teams match up. AMP should make it out unscathed, but there should be some fireworks elsewhere in this pool. Surprisingly, for a team that was in the National Championship game a year ago and lost by just a point, the offseason headlines in the mixed division did not focus much on #3 Philadelphia AMP. There was concern that AMP might have a down year after some significant roster changes. Even early in the club season, the criticism increased following two early season losses in a home tournament to #23 Pittsburgh Alloy and #6 Space Heater. AMP alleviated a lot of those concerns after not losing again until September. It turns out that adding former Truck Stop handler Nicky Spiva to the talented crew of Linda Morse, Calvin Trisolini, Nico Lake and Raha Mozaffari makes the group even more explosive on offense. Defensively, Philly still runs through Carolyn Normile. This team has a ton of superstars and is only getting stronger. Anna Thompson is continuing her return from injury. 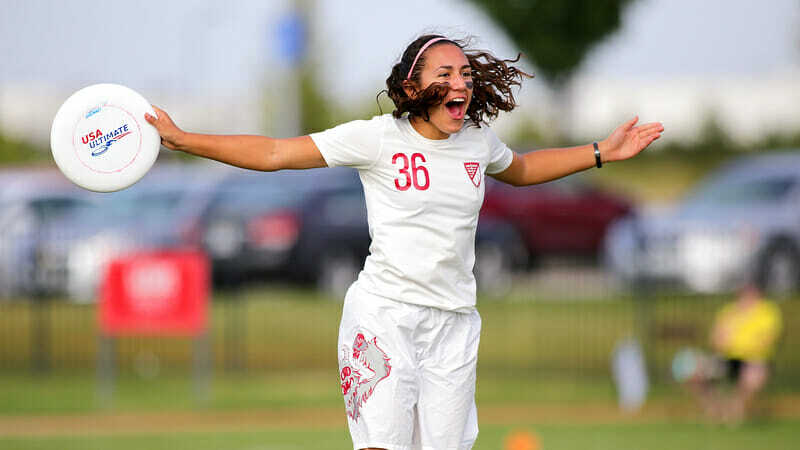 She missed most of the regular season, taking the field again for AMP at Regionals. Trisolini was also limited for much of season. This is a redemption tour for Philly. The first step will be making it through pool play with the ease of their predecessors. AMP has not faced any of the teams in Pool A this year. It seems like it should be any easy road back to the bracket for Mid-Atlantic champs, as Philly likely won’t be truly tested until reaching the quarterfinals. Qualifying for Nationals seemed like a formality for #11 San Francisco Blackbird throughout the regular season. That was cast into doubt at Southwest Regionals with a quarterfinal loss to local rival Mischief. Suddenly, the top seed in the region had to battle through the backdoor bracket, knowing a loss would end their season. Blackbird handled the adversity with no problem. Molly Hallweaver and Mac Taylor led the team to three straight comfortable wins to earn the final spot from the region. At Nationals, Taylor and Malina Wiebe will continue to initiate the offense and look downfield for Lexa Stambaugh. The defense will continue to play strict person matchup looking to put a lot of pressure to complete passes; on the turn, Vincenzo Vitiello marshals the backfield while Sally Mimms will grind downfield. Taylor will cross over on occasion if Blackbird needs to earn a break. It’s not complicated, but it can be very effective. Blackbird dropped a bunch of games at Pro-Elite Challenge, but since then, has only lost four games by a total of five points. They should have a mental edge over No Touching! with a regular season win in their only matchup at Elite-Select Challenge. San Francisco should be in the bracket. A national championship probably isn’t in the cards, but Blackbird could make a run with a favorable draw in the bracket and should find itself right in the heart of Pro Flight qualification. It was an up and down season for the veteran group from Minnesota. #12 Minneapolis No Touching! enters Nationals after taking the second bid from the North Central. No Touching! earned a 12-11 record playing a schedule almost exclusively against top 30 teams during the regular season, though their only win against one of the true top tier teams in the division was an upset over a reeling BFG at Pro Championships. No Touching! is 1-5 against teams seeded above them at Nationals. Three of the losses have been against crosstown rival #1 Drag’N Thrust. Justin Simanson will continue to lead the offense after leading the division in assists at the Pro Championships. Anna Hagstrom and Kristina Golling are likely targets downfield for Minneapolis. Sam Valesano continues to look like a star for this team. Defensively, Michael Swain produces a lot of turnovers for No Touching! This is an extremely veteran group that knows how to play to its strengths and hide weaknesses. Minneapolis has little familiarity with the rest of the pool. No Touching! lost to Blackbird at Elite-Select Challenge. It was just a two-point game in the third place bracket after both teams lost in the semifinals. Prequarters seems like a very attainable goal for this team. Mixed regionals across the country proved to be absolute insanity. #15 Durham Toro played a major role in the chaos showing up at Southeast Regionals as the no. 5 seed. Toro ran the table, upsetting Charlotte Storm, #16 Atlanta Bucket and Florida Weird en route to qualifying in commanding fashion with 15-9 victory in the game to go. While Durham might be an underdog in San Diego, they are familiar with playing on the big stage. Toro attended Nationals in Sarasota last year, finishing 12th. While Toro has not faced anyone else in Pool A this season, they lost to No Touching! at Nationals last year and dropped two games to Blackbird in Sarasota. When Durham is scoring, Heather Zimmerman is often on the receiving end. Toro does not have a star who will dominate the disc, instead showing good depth and consistency down the roster. Christine Bookhout and and Jackie Wang are key offensive pieces. It will be hard for Toro to outperform its showing last year, but making the bracket is well within reach. Comments on "Club Championships 2018: Pool A Preview (Mixed)"